The Fathead poppers will stay right on top and float high in the water. 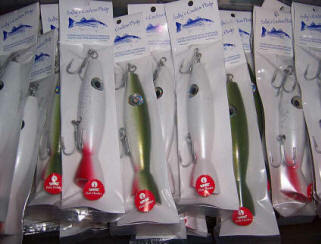 This allows you to work them nice and slow even in real fast water like breechways and outflows. Drives the stripers wild! The FATHEAD is sealed against water for maximum durability, and painted. Weighted perfectly for optimum presentation! 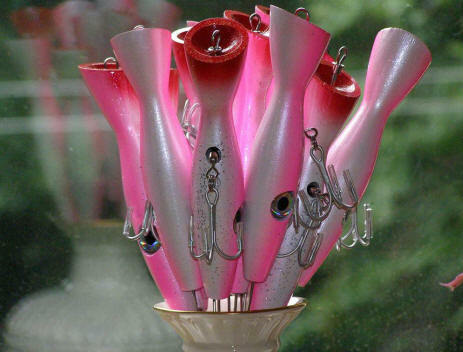 The 1.5 oz version uses a VMC Permasteel 2/0 belly hook and a dressed 5/0 VMC siwash hook, the 3 Oz version uses VMC Permasteel 4X strong 4/0 Belly hook, 4/0 treble tail hook. 150 lb Rosco swivels and 2X strong 90lb Rosco split rings. Oversized reverse Holographic eyes for maximum effect! Stainless Steel hardware where possible and through wired for maximum strength! Perfect for school blue fin tuna, stripers, or LARGE bluefish! this will allow the lure to "walk the dog" erratically from side to side. 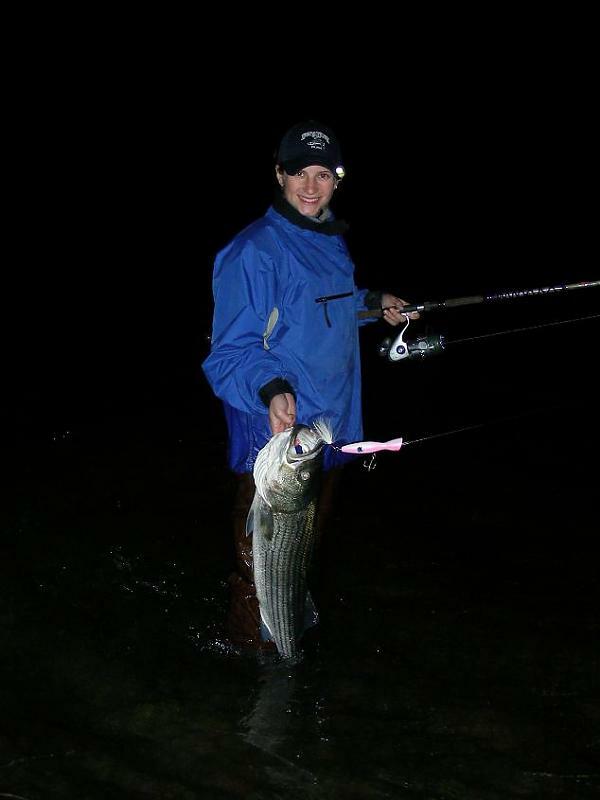 Vary your retrieve, slow for stripers, faster for bluefish. Digs and throws water! I like a very erratic action with these poppers, and don't be afraid to rip them fast either! 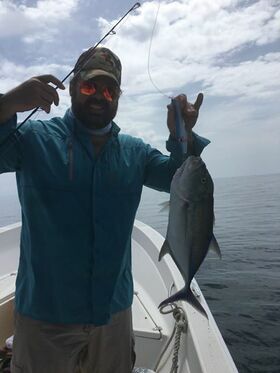 "Sorry I don't have any pictures but the Friday am (4-6) fishing was so HOT that I didn't have time. 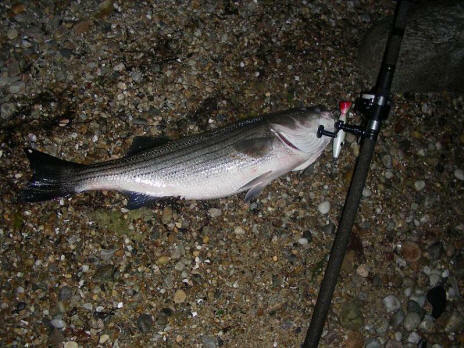 I was not going to kill stripers for a picture. I caught & released 3. 30" 32-33" and 34-35". All on your yellow Fathead Jr I purchased @ the MassBass show. I couldn't get the popper out fast enough! I got down to XXXXX at 4:15am and was 1 of 2 people there and NOBODY ELSE and TAILS SLAPPING EVERYWHERE! It quieted down at the slack and then the big ones came on the east bound. There was Tinker Mack ALL OVER the place. I had a bass chasing them at my feet!." 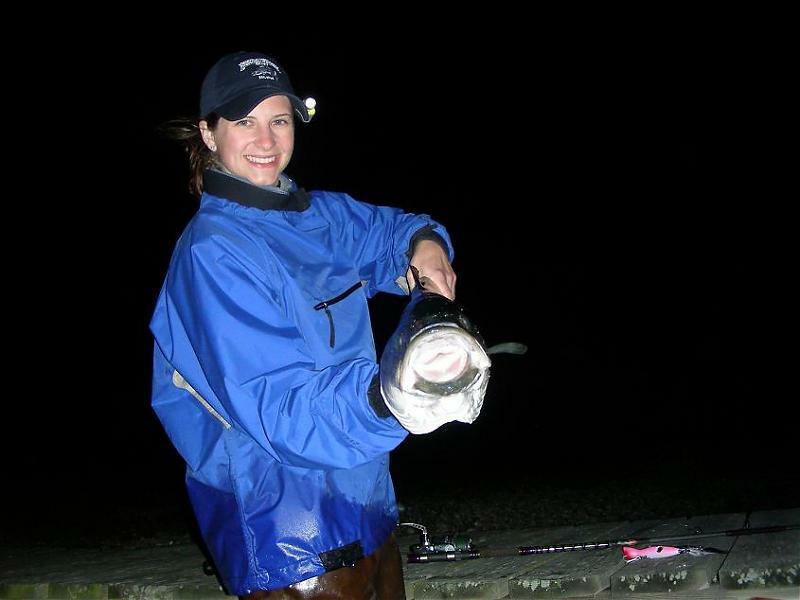 "As for the fathead, awesome, the thing casts a mile and catches fish like mad. It's running a close second as my new favorite lure this season"
"I think a while back I had asked you about the eel color, its my favorite, and it killed em!!! Took 3 fish the other night, 18-25 lbs. I haven't had that kind of action on a popper at night ever!!!! Made my uncle run to Dicks B&T to get one, unfortunately for him they only had the smaller sizes. 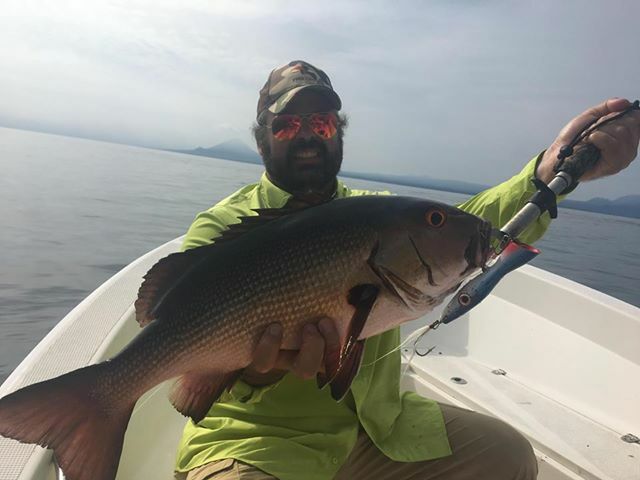 He landed a few smaller fish on the smaller fat head the next day." "GREAT LURES USED IN PANAMA LAST YEAR, CAUGHT ROOSTERS AND CUBERA WITH THEM"
"Just wanted to let you know that I have been doing great on your fat heads in both sizes-today I had a killer day on the 1.5oz pearl one-fished in blitz conditions and even managed two bass on one plug at once-one hit the treble the other hit the single hook buck tail. One of the things that is so great about the plug is it throws lots of water without really having to "work" the plug. These are very quickly becoming my fav surface poppers and they are not too expensive especially on the fat head Fridays you had. I will be buying more for sure!" with a Salty's Fathead popper caught fish!